Glasgow City Council will trial car-free zones outside schools in a bid to improve air quality for the city’s children. Under the scheme, seven primary schools across Glasgow will become temporary pedestrian areas in the morning and afternoon following complaints by parents that poor driving and parking, traffic congestion and harmful vehicle emissions are affecting safety outside the city’s schools. No start date for the scheme has been announced yet, although it is understood that the trial will last for up to 18 months once it has commenced. Cllr Chris Cunningham, city convenor for education, skills and early years, said: ‘There is a public demand from parents and residents to make sure children are as safe as possible when heading to and from school. A number of initiatives have already tried to clamp down on poor driver behaviour, but problems that put children at risk still persist. In 2016 Glasgow was found to have the highest rate of car trips to school of any city in Scotland. The council are currently consulting on the proposals, which will affect streets around Bankhead, Broomhill, Hillhead, Lourdes, Our Lady of the Rosary, St Blane’s and Toryglen primary schools. The seven schools chosen for the pilot all have evidence of high levels of car use outside the school gates and a history of concerns from residents. The schools’ eligibility has also been carefully decided bearing in mind other factors, such as their location on the road network and the effect displaced traffic would have on the nearby area. In 2016, a Scottish government study found that 30% of journeys to school in Glasgow are made by car – a higher rate than other Scottish cities including Aberdeen, Dundee and Edinburgh. Cllr Anna Richardson, city convenor for sustainability and carbon reduction, said she hoped the pilot would encourage more pupils to get to school using ‘active travel’ instead. Councillor Richardson said: ‘Creating a safer, more pleasant environment for children to walk and cycle to school can absolutely play a part in promoting a healthier lifestyle for young people. ‘Unfortunately, Glasgow currently has the highest rate of pupils being driven to school compared to the other cities in Scotland. This amount of traffic heading to the school clearly impacts on the wider environment and creates road safety risks at the school gate. Factors the council will use to measure the project’s success include an increase in the number of children walking and cycling to school, a reduction in congestion and speed of traffic around school gates and a reduction in the number of car journeys to the schools. 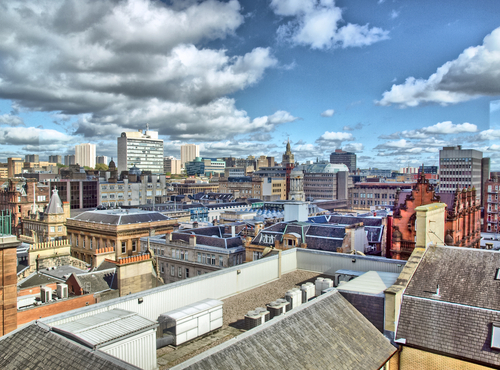 AQN recently spoke with Cllr Richardson about the Glasgow Low Emission Zone which you can read here.